Really great beach ! 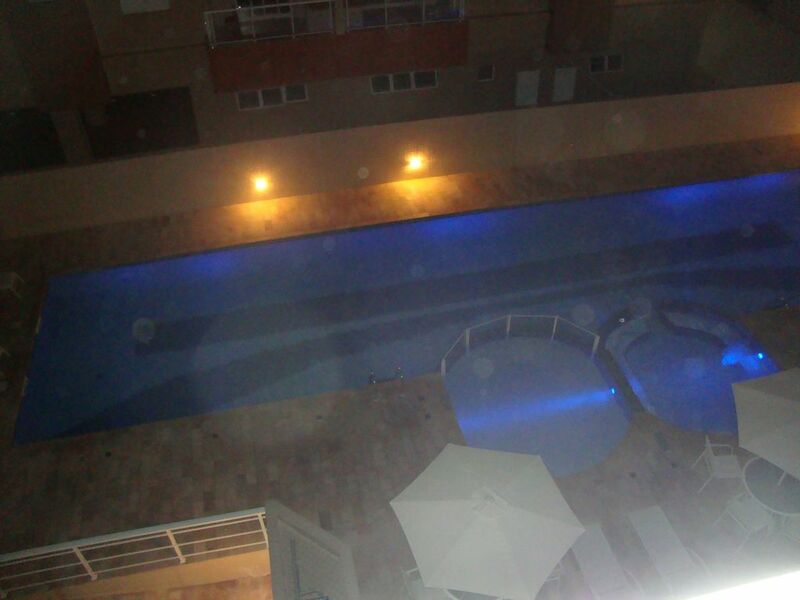 !3 beds (2 suites) 10 people!3 Pools!hydro! New! Beautiful high standard apartment 150m from the beach (Ubatuba).WI FI, 3 bedrooms (2 suites with 1 double bed and 1 double bed and 1 bunk bed), the other dormitory with 2 bunk beds (mattresses all D-28), 3 bathrooms with glass shower, granite countertops , cabinets, mirrors, hygienic shower! Kitchen: duplex refrigerator, stove, hood, microwave, grill, blender!equipped for 10 people! Dining room w / upholstered chairs! TV room, balcony / barbecue! All bedrooms with split air conditioning!Excellent apartment for allergy sufferers, ventilated, sunny ! !No Mold! Accommodation for 10 people in beds, closed condominium, 04 swimming pools (infantile, adult with cascades, SPA with hydro!, heated, enclosed! gourmet space w / oven for pizza, barbecue, stove, refrigerator duplex, tables with chairs (see charge for use), TV 32 ', sky, wi fi throughout apt. Game room (adult / child) Fitness! Wet sauna (under maintenance)! 2 covered spaces! Electronic gate, elevator, concierge 24hs, much security for children!We do not accept group of boys only! All bathrooms with tempered glass showers, showers with lots of water pressure, showers Hygienic, granite countertops, cabinets under bench. Novísimo apartment one block from the great beach!Prime location!Street faces out to the kiosk Canton!Complete relaxation ! !Brand new building in a prime location great beach!Heated pool!Adult and children's pools!SPA with Jacuzzi! Wet sauna with shower, fitness, games room (snooker, pimbolim, ping pong, tables and upholstered chairs) 4 spaces gourmet (barbecue, pizza oven, stove, refrigerator duplex, electric beer cooler, equipped with all appliances, granite countertops and tables with chairs)! The Praia Grande in Ubatuba, deserves its name. With almost two kilometers long and wide stretch of sand, it is the largest of the city's beaches and has great deals on apartments for the season. At the beach it is restaurants, supermarkets, bakeries, real estate, gas stations, newsstands and other commercial establishments. And being next to the center of Ubatuba, the real estate offers for rent are even more privileged. The public appears there, many resorting to rental homes in Praia Grande, is varied: ranging from families looking for a lively beach for sun and sea bathing the young in search of good waves and bustle of the various kiosks edge . Rent per season in Praia Grande and see the wonders of Ubatuba. The beautiful resort of Ubatuba, also known as 'Pearl of the North Coast', usually receive half a million tourists only in the summer holidays, and many seek homes in Praia Grande. This is one beach destination for many tourists, many of them from São Paulo and Rio, as the city is very close to Paraty (RJ) and Caraguatatuba (SP). The rental properties are located by the sea and on the banks of the Rio-Santos highway, which begins at the southern coast of Rio de Janeiro and goes to Santos, through the various options of houses for rent all over the North Coast of São Paulo . Rent per season in Praia Grande Ubatuba and enjoy the comfort, convenience and privacy that are not often found in hotels. The biggest buzz in Praia Grande is the season that runs from December to March, when schedules traditional 'Summer Project' encourage tourists and residents with bands, aerobic, sports games and other activities. But the movement is constant, even outside the holiday period and summer, with many tourists using the rental homes in Praia Grande to spend days of tranquility, with your feet in the sand and facing the sea. There is a large parking area and restrooms. His harsh sands and beats provide the practice of various sports such as football, volleyball and racquetball as well as being great for hiking. On the edge, a large number of kiosks are an attraction in itself. A cuisine that values ​​the fish and seafood the region is highlighted in the menus. All kiosks have large balconies with tables and chairs to enjoy a bar environment by the beach. Many of them have live music shows. Ubatuba is one of the "surfing capital" in Brazil and the Great Beach has great influence on this reputation. Good waves attract practitioners from across the country, looking for homes in Long Beach and soon apoveitam the first waves of the day. There exists even a municipal surfing kindergarten. Other water sports such as windsurfing and canoeing are also practiced. But who is just wanting a calm sea bath need not worry; more tranquil sea passages and the Fire Department is present on the beach all year round, ensuring the safety of bathers. We have an apt w / (7 adults and 2 children) 400 meters from the beach of the cove (cod. 3494673) and a beautiful house with 6 bedrooms (up to 16 people, beach pernambuco), 4,291,377 code and fit in Guaruja ( 10 people), beach cove (rcód. 952,876), see this site!